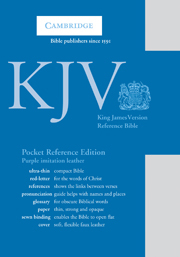 The KJV Pocket Reference Bible is a new addition to the Cambridge catalogue but it actually represents a familiar edition – the elegant KJV Pitt Minion – in a very compact and portable format. 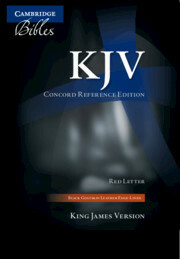 It includes the Old and New Testaments, supported by the Cambridge bold-figure cross-references, together with a pronunciation guide and glossary. The Bible has a sewn book block, allowing it to open flat. It is bound in black French Morocco leather and has a ribbon marker and gilt page edges. 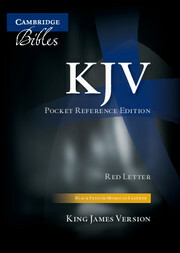 Cambridge Pocket Reference Bible provided by Cambridge free of charge. No positive review was required or promised, only an honest review. A few highlights before we begin •	Ultra thin compact reference Bible •	Words of Christ in Red •	Bold Figure References •	Glossary •	Gilt page edges •	Smythe Sewn Binding •	French Morocco Leather •	Zip closure Few things in this world feel like a Cambridge Bible and it is nearly impossible to describe a Cambridge Bible without using a superlative term. The Cambridge Pocket Reference Bible is no exception… The Cover Material Cambridge uses black French Morocco Leather for this edition. The grain is very subtle, much more so than on the Clarion. You can feel the texture for sure and I absolutely love the way it feels in my hand. The cover is noticeably stiffer than on other Cambridge Bibles. You definitely want a more firm cover in this Bible because it is intended to be kept in your pocket. Incidentally, even though I will not provide a picture of my back pocket this Bible fits there perfectly. Font & Layout This is a 4.5/5 point Times Semi-Bold. 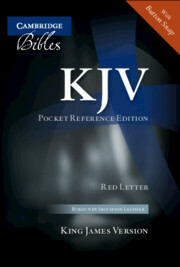 This is ideal for a Bible that you are going to take with you on the go. I do not know that my eyes would tolerate this as a daily Bible though someone with better vision will most likely not have trouble. 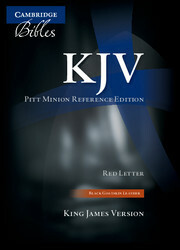 The text is laid out in a double column verse-by-verse format with center column references. Surprisingly, there is a bright red ribbon marker. In all honesty, I have no idea why it is there. It gets caught in the zipper almost every time. Paper The paper is another surprise. If I had not held this Bible, I would never have believed the paper that comes with it. I think it is actually better than in the Clarion. For such a tiny Bible, it is very opaque. There is a little ghosting but nothing that would be annoying. If you were so inclined, a ball-point pen could be used with little issue. I doubt highly that there would be any bleed through. Overall Impression It’s a Cambridge and is every bit as desirable and enjoyable to use as its larger brethren. I would say that this Bible should be the first choice in two scenarios: 1. You want a premium Bible but have a limited budget. 2. You need a Bible that can withstand the rigors of daily use, going in and out of pocket etc. $60 directly from Cambridge University Press is a spectacular price. Evangelical Bible’s website has it at an even lower price. My ministry offers a free Bible to those in need and I could actually see us offering this Bible under the right financial circumstances. 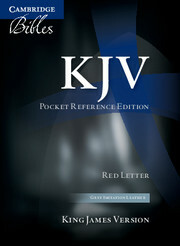 I would absolutely recommend the Pocket Reference Bible to anyone that asks about it.